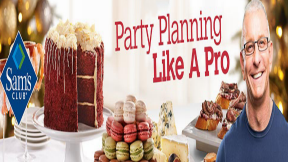 Food Network Party Planning Like a Pro Sweepstakes – Win a $500 Sam’s Club gift card & more! Win a $500 Sam’s Club gift card and a one year Sam’s Club “Plus” membership! SWEEPSTAKES ENTRY PERIOD – Beginning at 10:00 a.m. Eastern Time (“ET”) on October 22, 2015 until 10:00 a.m. ET on December 31, 2015. PRIZES – Grand Prize The Grand Prize Winner will receive a $500 Sam’s Club gift card and a one (1) year Sam’s Club “Plus” membership (the “Grand Prize”). Approximate retail value (“ARV”) of the Grand Prize: $600. First Prize Each First Prize Winner will receive a one (1) year Sam’s Club “Plus” membership (the “First Prize”). ARV of each First Prize: $100. Second Prize Each Second Prize Winner will receive a Wolfgang Puck 10-piece stainless steel mixing bowl set (the “Second Prize”). ARV of each Second Prize: $29.99. Third Prize Each Third Prize Winner will receive a KitchenAid® three-piece chef knife set (the “Third Prize”). ARV of each Third Prize: $15.98. 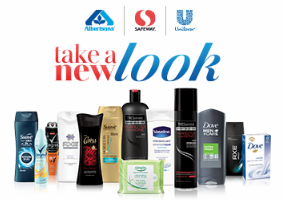 Safeway-Albertsons Holiday #TakeANewLook Sweepstakes – Win a $500 Safeway gift card & more! Win a $500 Safeway gift card & more! ENTER SWEEPSTAKES HERE – Safeway Sweepstakes page. ENTRY LIMIT – Limit: One (1) Sweepstakes Entry per person per day. ELIGIBILITY – Open only to legal residents of Alaska, Arkansas, Arizona, California, Colorado, Washington D.C., Delaware, Hawaii, Iowa, Idaho, Illinois, Indiana, Louisiana, Maine, Maryland, Massachusetts, Montana, North Dakota, Nebraska, New Hampshire, New Jersey, New Mexico, Nevada, Oregon, Pennsylvania, Rhode Island, South Dakota, Texas, Utah, Virginia, Vermont, Washington or Wyoming, who are eighteen (18) years of age or older at the time of entry. SWEEPSTAKES ENTRY PERIOD – The Sweepstakes begins at 12:00 p.m. “noon” Eastern Time (“ET”) on Monday, October 26, 2015 and ends at 11:59 a.m. ET on Tuesday, December 1, 2015. 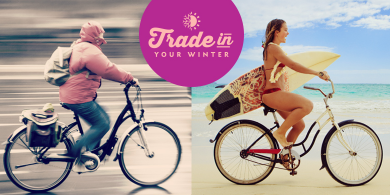 Hawaiian Airlines Trade in Your Winter Sweepstakes – Win Hawaiian Airlines miles! Win 80,000 Hawaiian Airlines HawaiianMiles (4 winners)! ENTER SWEEPSTAKES HERE – Hawaiian Airlines Facebook page. ENTRY LIMIT – Limit: You may enter one (1) time during each Weekly Entry Period. ELIGIBILITY – Hawaiian Airlines Trade in Your Winter Sweepstakes is open only to legal residents of the fifty (50) United States and the District of Columbia who are at least eighteen (18) years old at the time of entry. SWEEPSTAKES ENTRY PERIOD – The Sweepstakes begins on October 19, 2015 at 12:00 a.m. Eastern Time (“ET”), ends on November 15, 2015 at 11:59 p.m. ET. 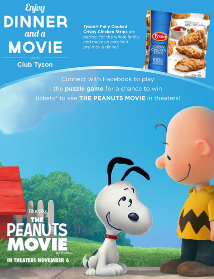 Tyson Peanuts Movie Sweepstakes – Win a ticket to the new Peanuts movie! Win a movie tickets to see the new Peanuts movie (200 winners)! ENTER SWEEPSTAKES HERE – Tyson Sweepstakes page. ENTRY LIMIT – The maximum number of entries that an entrant can possibly receive for the sweepstakes is three (3). One entry if the user decides to skip the game and enter via email; two entries if the user completes the puzzle slide game with an additional optional entry for sharing the game via Facebook. ELIGIBILITY – The Peanuts Movie Sweepstakes is open to legal residents of the fifty (50) United States and the District of Columbia, who are the age of majority in their state of residence at the time of entry. SWEEPSTAKES ENTRY PERIOD – The Sweepstakes begins on or about 12 noon Central Time on October 22nd, 2015 and ends at 12 noon Central Time on November 22nd, 2015. Panera Bread Sandwich Aptitude Test Sweepstakes – Win $30,000! ENTER SWEEPSTAKES HERE – Panera Bread Sweepstakes page. ENTRY LIMIT – Limit: An entrant may receive up to four (4) entries for completing the Sandwich Aptitude Tests during the entire Sweepstakes Period, and regardless of the method used to obtain bonus entries, up to five (5) bonus entries per day, during the Sweepstakes Period. ELIGIBILITY – The Sweepstakes is offered only to legal residents of the fifty (50) United States, the District of Columbia, and the Province of Ontario, Canada only who are at least eighteen (18) years of age at the time of entry. SWEEPSTAKES ENTRY PERIOD – The Sweepstakes begins on October 26, 2015 at 12:00 PM (noon) Eastern Time (“ET”) and ends on November 16, 2015 at 11:59:59 PM ET. Toys R Us Geoffrey’s Awesome Christmas Sweepstakes – Win a trip to Jamaica! Win a trip for 4 to Jamaica! 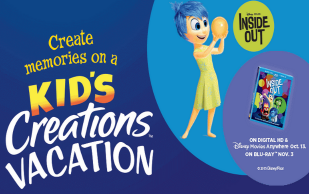 ENTER SWEEPSTAKES HERE – Toys R Us Sweepstakes page. ENTRY LIMIT – Limit of eight (8) Entries per person, per email address, per day throughout the Promotion Period. ELIGIBILITY – The Promotion is open only to legal residents of the 50 United States and the District of Columbia, who are at least 13 years of age or older as of date of entry. 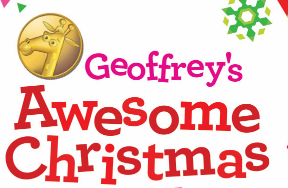 SWEEPSTAKES ENTRY PERIOD – Geoffrey’s Awesome Christmas Sweepstakes begins at 09:00:00 AM Eastern Time (“ET”) on October 11, 2015 and ends at 11:59:59 PM ET on December 12, 2015. (1)FIRST GRAND PRIZE: One (1) Toys”R”Us” Us Gift card in the amount of $2,000. The Approximate Retail Value (“ARV”) for the first Grand Prize is $2,000. -Hotel accommodations for five (5) days/four (4) nights in One (1) standard room with occupancy for up to two (2) adults and two (2) children (age 15 and under) provided by Unique Travel Corp. (the “Second Grand Prize Provider”). Airfare is not provided by Unique Travel Corp.
One (1) Toys”R” Us gift card in the amount of $100. The ARV of each Sweepstakes Daily Prize is $100. Figi’s Fall 2015 TV & Blu-Ray Disc™ Player Giveaway Sweepstakes – Win a 32″ HDTV & more! 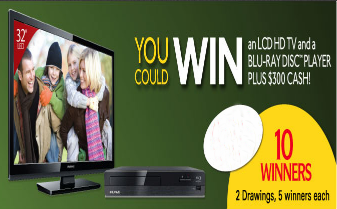 Win a 32″ LED HDTV, a Blu-ray disc player & $100 (10 winners)! ENTER SWEEPSTAKES HERE – Figi’s Sweepstakes page. ELIGIBILITY – Giveaway is open and offered only to legal residents of the 50 United States and Washington, D.C., who are at least 18 and the age of majority under law as of October 18, 2015. SWEEPSTAKES ENTRY PERIOD – Giveaway begins October 18, 2015 and ends December 31, 2015. PRIZES – Ten (10) Prize winners will each receive: one (1) Magnavox 32” LED HDTV, one (1) Funai Blu-ray Disc™ Player, and $100 USD check. Approximate Retail Value (“ARV”) of Grand Prize: $470.00 each. Tweezerman #TweezermanTurns35 Sweepstakes – Win an iPad Mini! ENTER SWEEPSTAKES HERE – Tweezerman Sweepstakes page. ELIGIBILITY – Must be a US citizen to enter. SWEEPSTAKES ENTRY PERIOD – Contest Period: October 1st, 2015-October 28th, 2015. Winner will be chosen on or around October 29th. PRIZES – One grand prize winner will receive the (1) Apple iPad Mini 4. Actual Retail Value of Apple iPad Mini is $399. 35 runner-up winners will receive an engraved tweezer with their first name engraved on the product. Actual Retail Value of the Engraved Tweezer is $28.00. 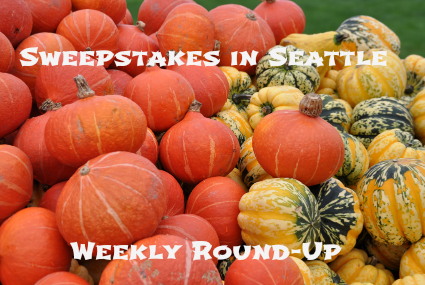 Sweepstakes in Seattle Weekly Round-Up 10/25 – Win a trip to the Super Bowl, $5,000, gift cards & more! Happy Halloween! I know, technically, it isn’t Halloween yet, but by the time the next weekly round-up gets posted, it will be November and we will have finished celebrating Halloween and the fact that we get an extra hour of sleep! I like how those two things are together this year. This week I am celebrating my wedding anniversary (#16), so if you don’t see posts every day this week, don’t panic, I’m just going to spend time enjoying my sweet husband and my son. Have a great week sweeping! Remember, Sundays I will only post the weekly round-up so you can get caught up and see if you missed any of the sweepstakes posted during the past week. Have a great Sunday and check back tomorrow for new sweepstakes! I’ll also share winner’s stories here, so if you win a prize, let me know and you can be a part of the weekly round up! Margaret won a song download from the Twix IWG! Congratulations, winners! Did you win a prize? I’d love to hear about it and share your winning story right here on the weekly round-up, just leave a comment on the blog.